I shall come to ask for... the Communion of reparation on the first Saturdays..."
and these souls will be loved by God, like flowers placed by me to adorn His throne." was holding in her other hand. 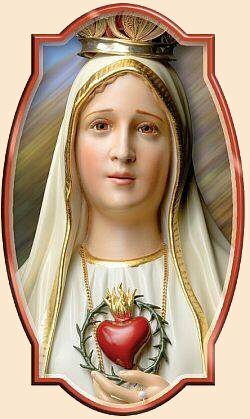 to make an act of reparation to remove them"
"Look, my daughter, at my heart, surrounded with thorns with which ungrateful men pierce it at every moment by their blasphemies and ingratitude. You at least try to console me and say that I promise to assist at the hour of death, with the graces necessary for salvation, all those who, on the first Saturday of five consecutive months, shall confess, receive Holy Communion, recite five decades of the Rosary, and keep me company for fifteen minutes while meditating on the fifteen mysteries of the Rosary, with the intention of making reparation to me." 3. 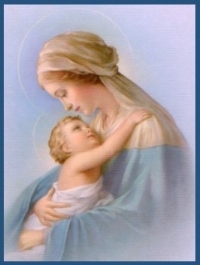 "Recite five decades of the Rosary"
4. "Keep me company for fifteen minutes while meditating on the fifteen mysteries of the Rosary"
(This is separate from the Rosary itself and preferably done in the presence of Our Lord in the Tabernacle or at Exposition of the Blessed Sacrament where available. necessary for salvation for those who practice the devotion. the Devotion to the Immaculate Heart. Note: We should always keep in mind that, in 1531, when Our Lady of Guadalupe appeared to Juan Diego, she referred to herself as "ever-virgin". And in 1858 when she appeared to St. Bernadette she said, "I am the Immaculate Conception". Anyone who contradicts these Dogmas blasphemes and causes her great suffering.